Welcome to the home of ITP Watch. We are a transparency project of the Kent County Taxpayers Alliance, a local taxpayer-advocacy organization, based in Grand Rapids, Michigan. Our mission is to shine the light on the operations and budget of the Interurban Transit Partnership (also known as “The Rapid”). The ITP is the public transportation agency that covers the area of six of Kent County’s cities: Grand Rapids, East Grand Rapids, Kentwood, Wyoming, Grandville, and Walker. ITP Watch’s efforts are directed at The Rapid because it operates with minimal transparency. 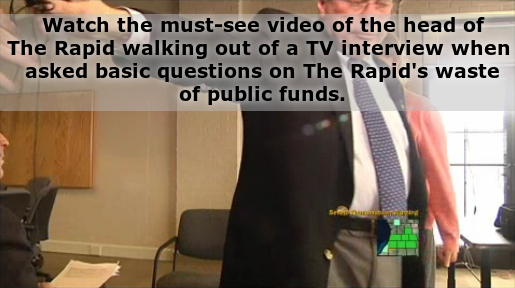 The Rapid only makes limited information available to the public through its web site. Our site posts budgets, operational reports, audits, and other important information that taxpayers should be aware of. We do this because The Rapid does not. This site additionally comments upon this withheld information so that informed decisions can be made regarding The Rapid’s frequent tax increase requests. For the latest news and information from ITP Watch, please go to our News and Updates page.